Enclosed by a lake with dazzling water, Golden Temple is located in a city of Amritsar. It was erected in 1574 by Guru Arjan, the first Sikh Martyr. Shiny with 750 kg of pure gold, pleasant ambience and the sanctified crystal clear water are some of appealing features of the golden temple - the most famous sacred temple of Sikh in Amritsar. It is indeed a standing beauty of harmony and purity. Also hailed as Shri Harmandir Sahib, the beautiful temple also possesses many other small shrines in its premises. Paying a visit to this superb formation of Sikh religion will enable the devotees to scout unparalleled peace and calmness and will take you through mysterious holiness and ecstasy. From morning to evening, one can listen to the prayers getting echoing within the premises of the shrine. All this creates a wonderful atmosphere that one will love to experience repeatedly. The history of Shri Harmandir Sahib starts with Akbar, a Mughal emperor who presented this place to the third guru Amar Das's Daughter, Bibi Bhani and after her marriage with Jetha, he became the fourth guru, Guru Ram Das. In the year 1577, the fourth guru began erection of the temple land. The erection of Golden Temple got completed in the year 1604. And on 1st September Guru Granth Sahib got installed and to take care of that the fifth guru, Guru Arjun dev had chosen a sikh whose name was Baba Buddha. After the attack of Ahmed Shah Abdali, an afghani general, Maharaja Ranjit singh funded marble in the year 1830. In 1984 the Harmandir Sahib was strafed by Indian army troops in which more than 500 folks died. Though you can visit round the year, the time it remains packed with tons of travelers is from October to March. By Air: The nearest airport to reach Golden Temple is at Amritsar, about 15 km from city center. Raja Sansi International Airport offers a range of domestic as well international flights to the main cities of India and foreign countries connecting Punjab. 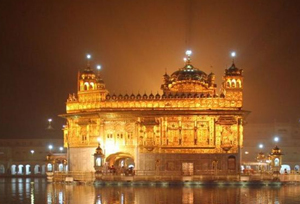 By Train: The charming city of Amritsar is well connected to the main cities of India by rail. One can take a taxi from the railway station to make it to the shrine. By Road: Direct bus services are available from Delhi, Chandigarh, Jammu, Dharamshala and many other cities of India to Amritsar.